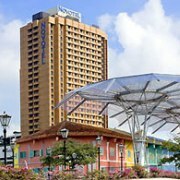 The Novotel Clarke Quay Singapore is conveniently located near the famed Orchard Road Shopping Paradise, the Suntec City convention centre and the Singapore Exposition Hall. It is also next to Clarke Quay, Boat Quay and Robertson Quay, which offer an exciting blend of entertainment, shopping and a variety of dining experiences from international cuisine to delectable local fare. The hotel features 402 beautifully appointed rooms, 5 meeting rooms, swimming pool, restaurants and bar.